Fourteen Jewish youths arrested in anti-Arab vandalism case are released, parents accuse police of seeking good PR at childrens' expense. All 14 Jewish youths who were arrested last week in connection with the vandalism of Arab-owned property in Jerusalem have been released. The 14 teens, all minors, were suspected of anti-Arab vandalism in the Shimon Hatzaddik (Sheikh Jarrah) neighborhood. 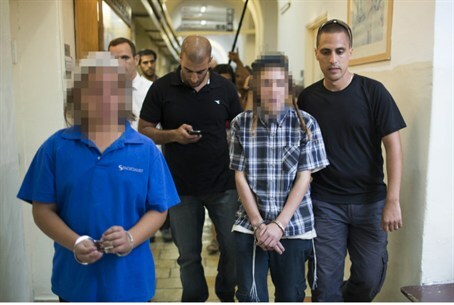 Upon their arrest, police announced the bust of a “youth gang” that had committed organized attacks on Arabs. However, the “youth gang” increasingly appeared to be an unorganized group of teens, some of whom had committed random acts of harassment, and none of whom were tied to any significant attacks. Eight of the 14 suspects were released over the past several days, and the last six were released Tuesday evening. A parent of one of the suspects accused police of using the frightened teens for PR purposes. “The rapid arrest of the youths shoes that police hurried to make empty proclamations about their achievements,” he said. “It’s a shame that this false ‘achievement’ came about through illegal investigations at the expense of scared 13-year-old yeshiva students,” he accused. The youths were represented by the Honenu legal rights groups. The group reported that some of the youths said they were questioned in the middle of the night, without their parents present, which is against the law. Several youths also reported that police belittled them and attempted to humiliate them.